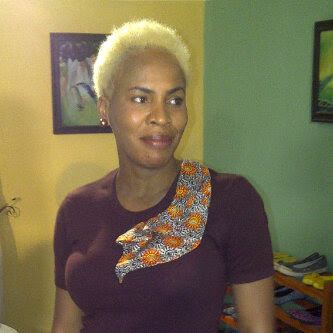 Welcome to Linda Ikeji's Blog: Actress Fathia Balogun's New Look! No i dont like. Shikena. Wish I could be clearer than this!!!! Linda, Hell no I don't. She could scare kids. Can she just dye her hair again? Or visit a gud stylist? HELL NO I DON'T !! THANK YOU !! Hell nooooooooooooooooooooo, so not it. i hope its just for a movie role coz dis hair is a no no. the woman is growing older by the day. linda, tell him to reconcile with her husband oooooooooo at least to bring back her rejuvenation. e be like say cracy don start what the hell is that? she luks like an ageing greyn meerkat! was it 4a movie? Anon 1:20pm, na by force to speak english???? shuo!!!!! mbanu abeg remove it with immediate effect kai. She for bleach her eyebrows too nah. why? at her age? she should go and sit down jor. All the small hair on her head will soon perish due to bleaching as i doubt she can take care of it. Anyway she needs new customers....top runs geh! i salute ma! @ ANON 11:58 AM so are you suggesting that Fathia is using her hair for spiritual stuffs???? gist! Ewwwwwwwwwwwwwwwwwwww! Nooooooo! Fathia I beg you, remove this thing NOW! prolly she's joined the macossa dancing group, lol cos really wha was she thinking? this is ehewwgly, heck yeah it is! fathia pls dis doesnt go wit ur image. this is too local and terrible...someone pls advice her to get a new look. Peopel era just going insane, these days. whats this please? She looks horrible. How her exhusband come enter this one nah? Did he force her to do the hair. She is looking so old and Mgbekeish. Nne biko find a wig before something else happens. Infact the comments of some people on this blog ehnn,,its something else.....what has her ex-husband's issue got to do with her hair style??? wharra hell, I don't like it at all. Leave it for Amber Rose. Wetin be this? Fathia na fine woman. Why she wan spoil her looks with this kin yeye hair? Mcheewww! Is it because she's not wearing some silky Brazilian/Indian/Russian/Iraqi hair reaching down to her nyash that you people are insulting her like dis? If Linda were to photoshop dis photo now and superimpose one shiny lacefront onto the woman's head all of your comments will suddenly change direction. It's a sad thing indeed that Naija people cannot love the hair that grows naturally out of their heads. God made Fathia and he made her hair and He does not make ugly things! Fathia, rock on jare...your look is fierce, fresh and edgy! Fire burn your haters! oh my God! why did she do dis to herself? She's a pretty woman, I just don't like the blonde or yellow color. She should leave it short and her natural color. madam tinuke please grow up and be matured. stop being tribalistic. sorry to say this but i have noticed that majority of the yorubas are very bitter towards ibos and we say we are religious or love our neighbors as ourselves...... as i was saying before i was rudely interrupted.....me like the hair,i dye myn golden though have stopped. i think its cool to once in awhile give urself a diff look and feel d flow @ dat tyme but like some pips pointed out, it could be a role she has to play maybe all dis campus razz old girls (gbo gbo bigz girls role). fatai b..... you rock. pls put the hair in curls and enjoy it. i believe its for a role. She's not Yoruba! !..she's from Benin..and please Ibo and Yorubas are as bad as each other..if they both had co-operated since the time of Zik-Awolowo..9ja would have been the envy of the world..both sides are way too paranoid!!.. Faith is not Yoruba she is just a Yoruba actress and her tribe has nothing to do with her looks. If she likes her new look. Good if not let her change her stylist. Abi. It is all about her. Like it or leave it. nooo she looks more like A.SONG from arsenal.